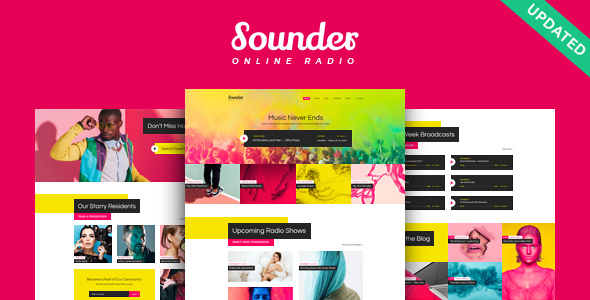 Sounder is an amazing colorful bright WordPress theme with the functional modern design. It is suitable for contemporary online radio, radio station company, music band, stylish dj, attractive singer, artist bureau, cultural events agency, and entertainment business firm websites. The theme includes 3 homepage layouts allowing you to give all the necessary information about dj’s compilations, radio hits, discography services, radio residents solutions and any upcoming music events. With Sounder, you can showcase your photo and video galleries of the held or planned events. The theme can also be interesting for music producers, musicians or anyone in the music industry or blog. The theme is fully responsive and Retina Ready, so it looks amazing on any platform. Sounder is compatible with a bundle of premium plugins, like Essential Grid, WPBakery Page Builder, Instagram Feed, etc., to make it easier to setup and operate your website. - An option to add radio-streaming is added to the audio widget.